VECTASHIELD® Mounting Media offer unsurpassed anti-fading properties for fluorescence applications. For a trial-sized FREE SAMPLE* email us at vector@vectorlabs.com with your mailing address and your choice of VECTASHIELD®Mounting Medium listed below. * One per customer. For U.S., U.K. and Canada customers only. While supplies last. Figure Legend. Prostate: Anti-Prostate Specific Antigen (rp) detected with an Alkaline Phosphatase conjugated antibody and Vector® Red Alkaline Phosphatase Substrate. 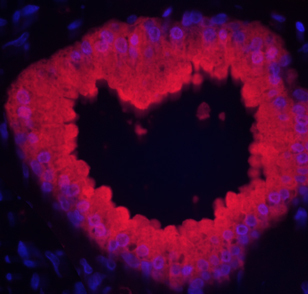 Mounted in VECTASHIELD® HardSet™ Mounting Medium with DAPI. Visualized under fluorescence microscopy. Vector Laboratories Inc., 30 Ingold Road, Burlingame, CA 94010. (800) 227-6666.